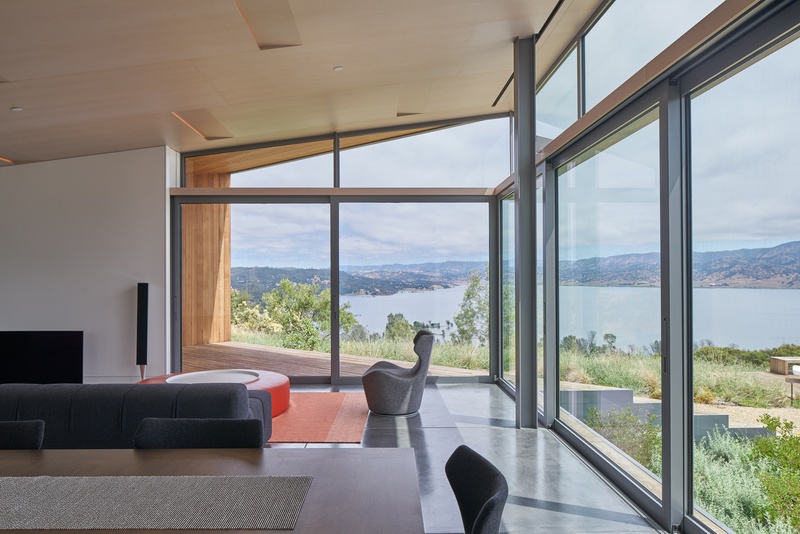 The structure consists of four blocks arrayed around a central rhombus-shaped court to take advantage of a 360 panoramic views of the nearby lake and surrounding mountains, while simultaneously focusing inward to a glass-walled diamond shaped courtyard at the house’s center. 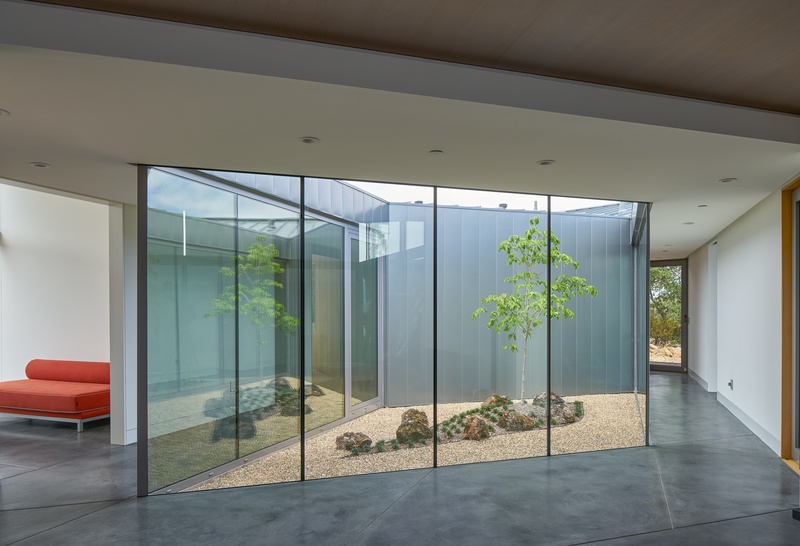 The panorama that wraps the house differs significantly on each side, enabling the perception and experience of a place that changes dramatically as one moves throughout the space. 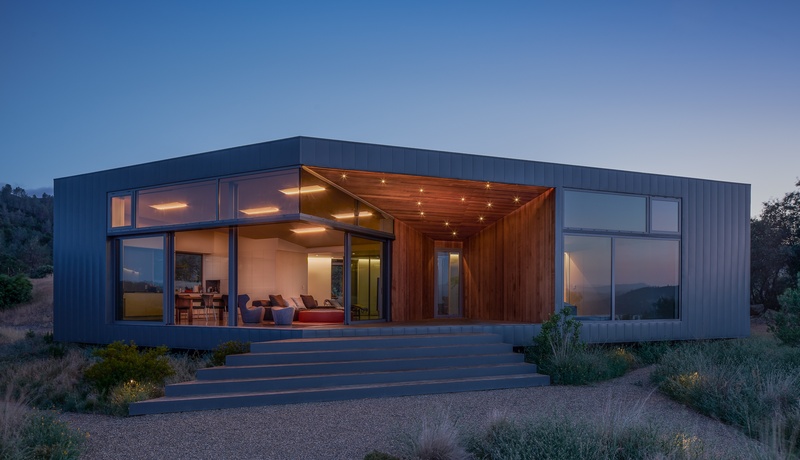 The house and freestanding garage are situated atop one of a series of meadows surrounded by Oak, Pine and Manzanita covered hills. Totaling 2,300sf, the home includes a living area, dining and kitchen space, master bedroom, kid’s bedroom, and yoga room. The design engages spatial dynamics through experiential activation of negative space relative to conditions of surface, material, view and landscape. The central rhombus court and four covered deck spaces are clearly defined as volumes of positively-charged negative space; each has its own character resulting from its position with respect to the landscape and the deep space of the extended site. Building materials consist of heavy gauge metal cladding that wraps around the volumes, angled corners and acts as framing that bends around varying sized windows and window walls with covered ventilated deck spaces. 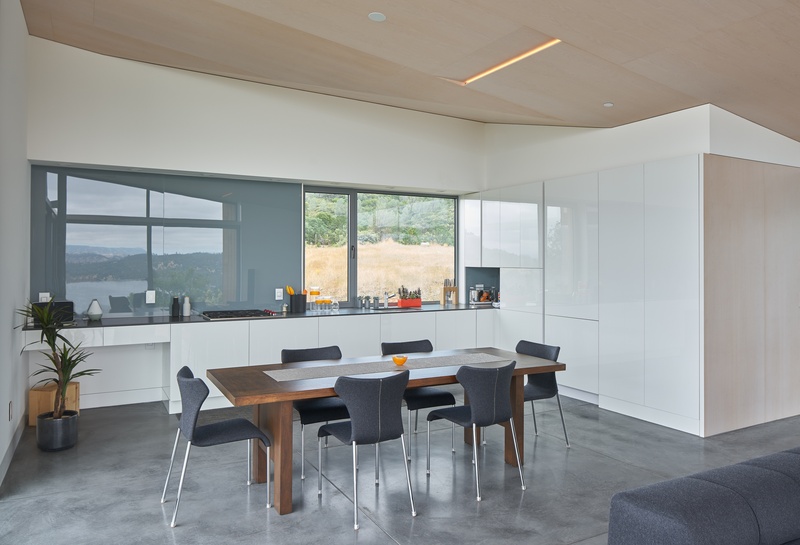 Interior finishes consist of stained and sealed concrete slab floors, and book matched panelized ceilings, walls and closets. The home is slightly lifted above the meadow elevation. Reinforced concrete mat slab, tapering upwards around the cantilevered perimeter eliminated the need for deep foundation piers and grade beams, and lets the house float above the meadow.